Calendula (Calendula Officinalis, a.k.a. “Pot Marigold”) has its well-defined place in the herbal world. It’s not only the bright color and sweet smell that distinguish this plant from the others. But mainly it’s healing power and capability to cleanse wound made it internal as well as external number one choice of herbal healer. 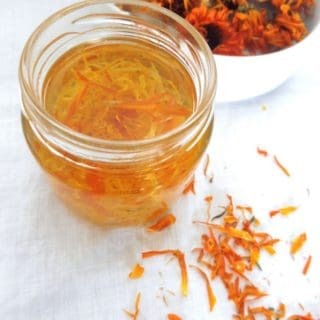 There are several ways one can extract calendula’s various medicinal properties. 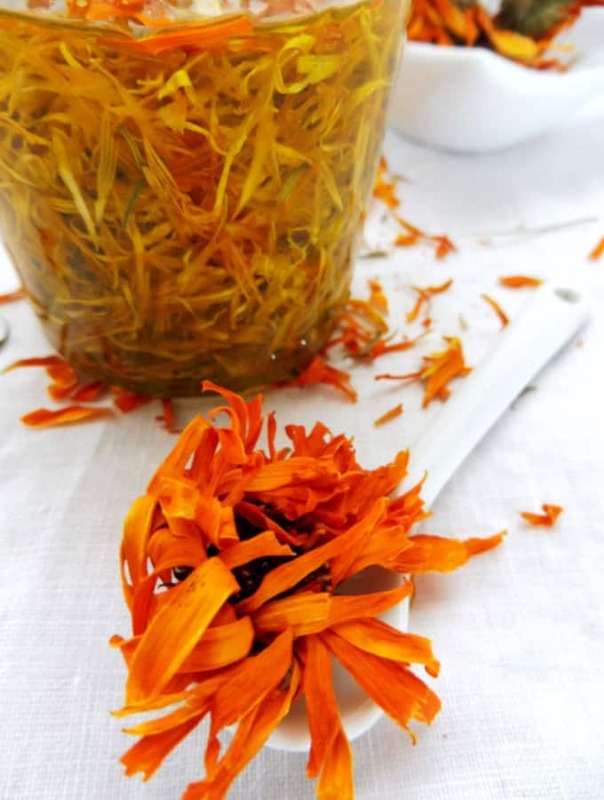 for internal use we can prepare calendula in form of tincture (extract of the plant in alcohol), calming tea (extract its calming properties in hot water) or capsules. For external use, we make infused oil (macerate the herb in oil) that can be further used in salves, balsams, ointments, lotions or lip balms. Calendula infused oil is prepared by maceration of calendula petals in oil where the herb releases its oil-soluble substances. 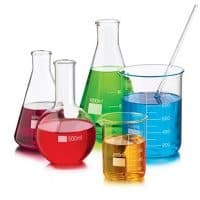 Calendula possesses excellent skin care properties when applied topically and therefore is very often used in natural health products in the market. 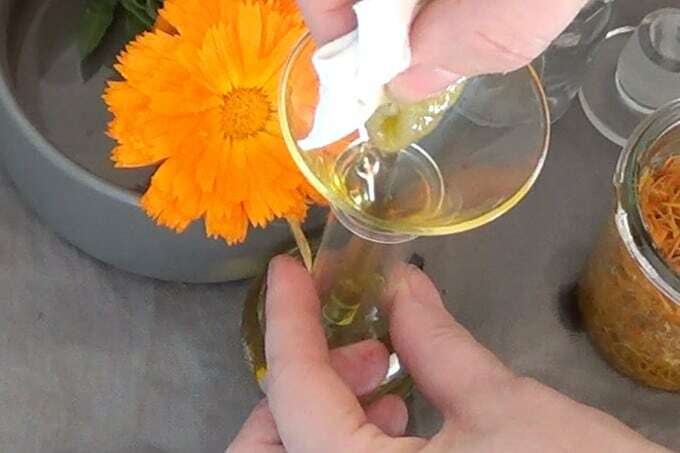 As this miracle plant is easily available let’s make our own calendula oil. Healing and soothing calendula oil is effective in the treatment of diaper rash or ear infection. Its anti-inflammatory activity is beneficial in the treatment of acne or dermatitis. 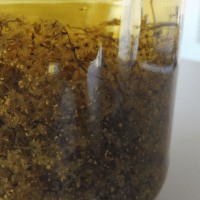 This natural herbal infused oil is an essential item in homemade first aid kit to heal scars, wounds or insect bites. 7. As a sunscreen – this study suggested that calendula oil cream can be used to protect the skin from UV radiations in the form of sunscreen cream and to maintain the natural pigmentation of the skin. 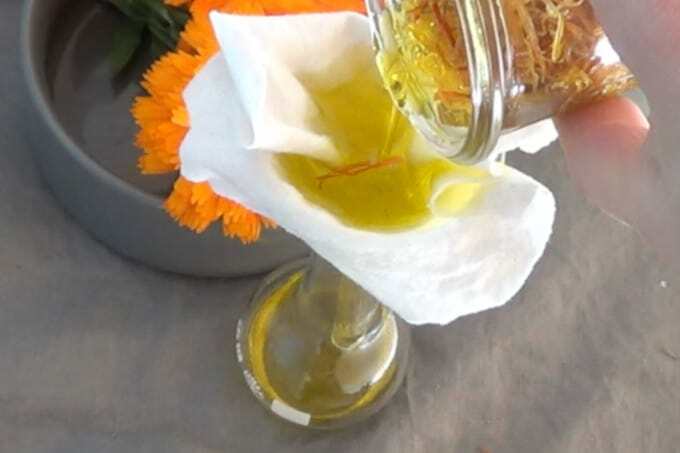 If you are planning to make your own sun screams calendula oil should definitely be considered as one of the sun protectors. How long the calendula oil last? 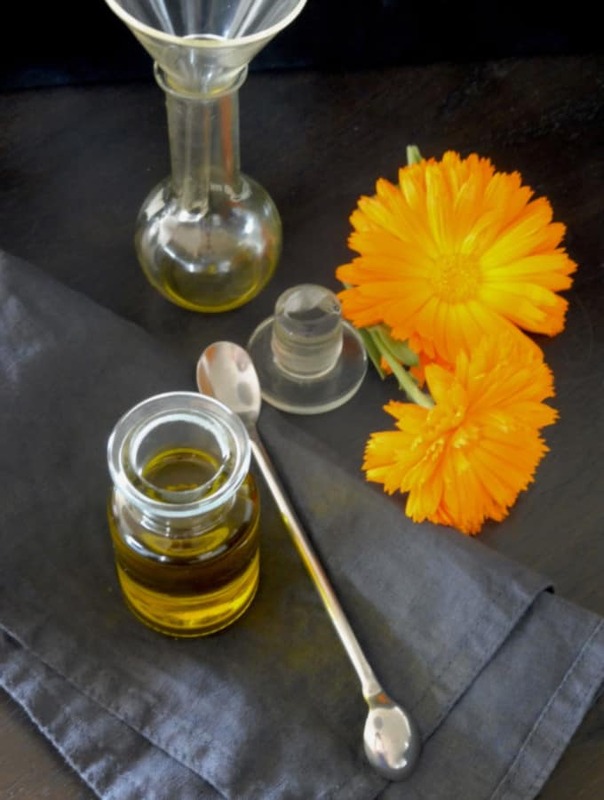 If stored in a dry and dark place calendula oil can last over 1 year. 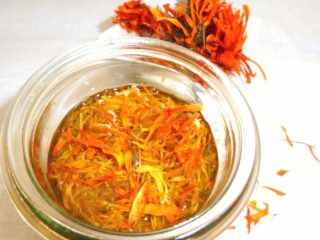 How to use calendula oil? 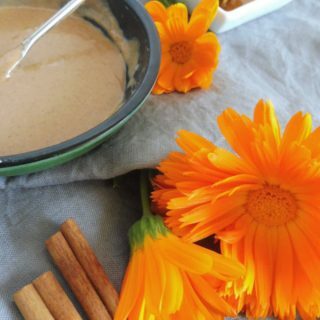 for instance, make a hair mask with banana – mix 1 banana with 2 spoons of calendula oil and create a banana paste. massage into wet hair and cover with plastic folium for 30 minutes. Subsequently, wash with shampoo and a lemon juice afterward. This mask nourishes and softens dry and damaged hair. 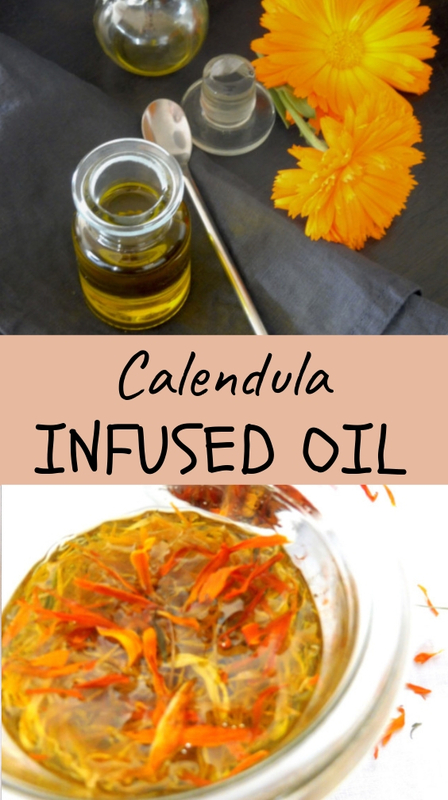 or calendula oil helps to moisturize dry scalps and keeps the hair follicles to grow. Apply this oil directly on your scalp. bath oil for babies – mix sunflower oil with calendula oil 1:1 and few drops of mandarin essential oil. use 2 tablespoons for 1 bath. This calming and moisturizing oil is ideal for dry and soft skin. massage oil for babies – mix sunflower oil (5 tablespoons) with calendula oil (4 teaspoons) and 8 drops of lavender essential oil and 6 drops of chamomile essential oil. This calming and healing oil is suitable for babies from the age of 3 months. 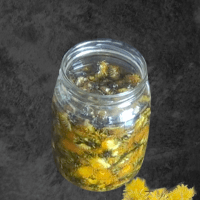 Fill your jar about halfway with calendula petals. Pour olive oil into the jar until it’s just about full. Make sure that herbs are covered completely with oil, if some oil evaporates just add more to cover them. Close the jar with a piece of cloth and rubber band so it can breath and place in a sunny spot. Shake occasionally to redistribute the jar’s contents. After 4-6 weeks, pour the jar’s contents through a small strainer or a muslin bag in a jar with lid which is dry and clean. Don't forget to squeeze a muslin bag before discarding as every drop of this valuable oil is counted. I’ve never thought to use calendula on scalps! My daughter had horrible cradle cap as a baby and, even now as a teen, still struggles with it. It’s not dandruff, really – much more like the dried sores and flakes of skin from cradle cap. Maybe calendula oil can help! Her diet is so clean and her hygiene is good, so we’ve had a hard time trying to think of something. She’s currently using a rosemary/ACV mix. 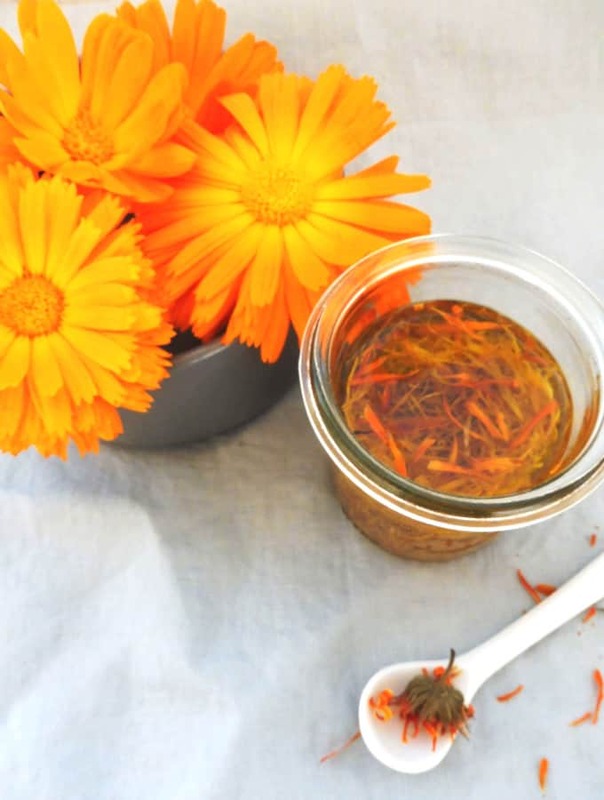 Hmm…time to infuse some calendula – thank you! This is awesome! I have a jar of calendula flowers I should use up. I’ll definitely use these recipes, thank you!